The book is the first autobiography of a high-ranking Israeli official published in China. 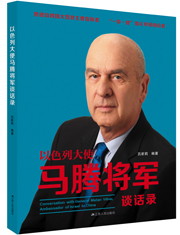 It describes the legendary military and political experiences of Matan Vilnai, Israel's influential retired Major General and former Ambassador to China. With 80 photos recording historical moments, the book analyzes the recent social and political history of Israel and allows readers to get a glimpse of the unknown details of war.